A reminder that the Zinio for Libraries app will be replaced by RBdigital tomorrow (April 17 2018). Your login will remain the same and you won’t lose titles you’ve already checked out. Have you tried the new RBdigital app? It’s available to download from your app store and is the new app for reading our Zinio (now-renamed RBdigital) magazine collection. It has some great features — see our previous blog post. If you open your existing Zinio for Libraries app, you will be prompted to download the new app, or depending on your device, visit your app store from these links: iOS | Google Play. 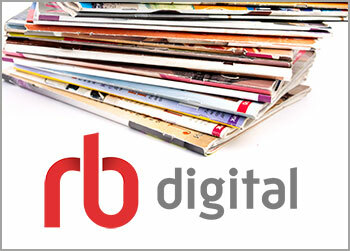 Alternatively, search for “RBdigital” in the app store, if you’re not reading this on your device. Originally, RBDigital planned to stop access to Zinio to Libraries in 2017, but to give library patrons more time to make the switch, they extended the changeover period. Download the new app and have a look round. There is a basic, but comprehensive help feature inside the app to get you started, or click on the image below for a quick guide to getting started.